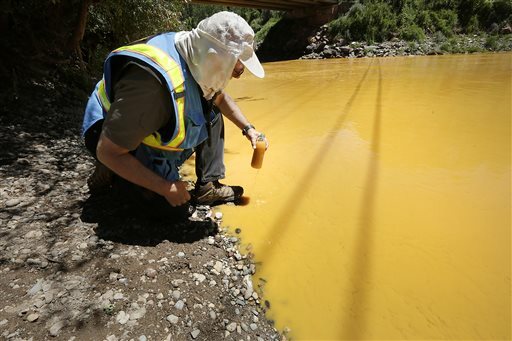 DENVER (AP) — A plume of orange-ish muck from million-gallon mine waste spill in Colorado was headed downriver to New Mexico, prompting communities along the water route to take precautions until the sludge passes. Officials emphasized that there was no threat to drinking water from the spill. But downstream water agencies were warned to avoid Animas River water until the plume passes, said David Ostrander, director of the EPA’s emergency response program in Denver. The U.S. Environmental Protection Agency said that a cleanup team was working with heavy equipment Wednesday to secure an entrance to the Gold King Mine in southwest Colorado. Workers instead released an estimated 1 million gallons of mine waste into Cement Creek. “The project was intended to pump and treat the water and reduce metals pollution flowing out of the mine,” agency spokesman Rich Mylott said in a statement. The creek runs into the Animas, which then flows into the San Juan River in New Mexico and joins the Colorado River in Utah. Officials weren’t sure how long it would take the plume to dissipate, Ostrander said. The acidic sludge is made of heavy metal and soil, which could irritate the skin, he said. The EPA was testing the plume to see which metals were released. Previous contamination from the mine sent iron, aluminum, cadmium, zinc and copper into the water, said Peter Butler, co-coordinator of the Animas River Stakeholders Group. As the plume headed toward New Mexico, that state’s governor said the EPA waited too long to tell her about the problem. Gov. Susana Martinez is disturbed by the lack of information provided by the agency to New Mexico’s environmental agencies, said Chris Sanchez, a spokesman for the governor. Sanchez said that the state was not told of the spill until almost a full day after it happened. The plume made its way to Durango on Thursday afternoon, prompting La Plata County health officials to warn rafters and others to avoid the water. The scenic waterway was the backdrop for parts of the movie “Butch Cassidy and the Sundance Kid” and is popular with summer boaters. Durango stopped pumping water out of the Animas River on Wednesday to make sure none of the waste could be sucked up into the city reservoir. It also suspended the transfers of raw water to a local golf course and Fort Lewis College. Pet owners were advised to keep dogs and livestock out of the Animas. In Farmington, New Mexico, city officials shut down water-supply intake pumps to avoid contamination and advised citizens to stay out of the river until the discoloration has passed. Don Cooper, emergency manager in San Juan County, said people should not panic because the EPA had told the county the spill would not harm people and that the primary pollutants were iron and zinc. “It’s not going to look pretty, but it’s not a killer,” Cooper told The (Farmington) Daily Times. The impact on wildlife wasn’t clear. There are no fish in the Cement Creek watershed because of longstanding problems with water quality, the Colorado Department of Public Health and the Environment said. Colorado Parks and Wildlife was placing cages containing fish in the Animas River to monitor what happens to them, spokesman Joe Lewandowski said. The U.S. Fish & Wildlife office in suburban Denver did not immediately return a call asking about the spill. Durango resident Lisa Shaefer said she was near the mine Wednesday when a mine bulwark broke and sent a torrent of water downstream that raised the water level 2 to 3 feet in Cement Creek. The initial wall of water carried rocks and debris and made a roar as it pushed through a culvert, she said. “What came down was the filthiest yellow mustard water you’ve ever seen,” she told the newspaper. “We don’t know what’s in it, but it’s safe.” Just like the nuclear fall out was safe, and the Uranium mines in Monticello were safe, and the NSA isn’t spying on American’s, and the IRS isn’t biased, and on and on and on. I trust the government about as far as I can chuck the White House. I don’t trust big business, either. If the mine company says it’ll be ok then I believe them 100%. Big business and mining companies never lie and always have the public’s well being as their top priority. Clean should come out of EPA budget solely. Although the EPA will receive much blame for this awful event, they wouldn’t have had to be there if the mining hadn’t been done in the first place. EPA messed up but dealing with mining wastes is an ugly job anyway you look at it. Allowing these activities near waterways where such things can have such a dramatic and devastating effect is just wrong.